Photograph of the inscription against the background of the Rockefeller Museum, seat of the Israel Antiquities Authority. Photographic credit: Yoli Shwartz, courtesy of the Israel Antiquities Authority. A rare 2,000 year old commemorative inscription dedicated to the Emperor Hadrian was uncovered in Jerusalem. According to Dr. Rina Avner, excavation director on behalf of the Israel Antiquities Authority, “This is an extraordinary find of enormous historical importance”. 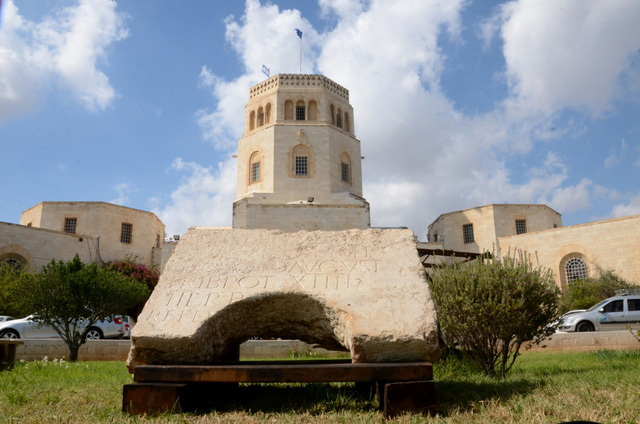 The inscription, consisting of six lines of Latin text engraved on hard limestone, was read and translated by Avner Ecker and Hannah Cotton of the Hebrew University of Jerusalem. The English translation of the inscription is as follows: (1st hand) To the Imperator Caesar Traianus Hadrianus Augustus, son of the deified Traianus Parthicus, grandson of the deified Nerva, high priest, invested with tribunician power for the 14th time, consul for the third time, father of the country (dedicated by) the 10th legion Fretensis (2nd hand) Antoniniana. According to the translators, “This inscription was dedicated by Legio X Fretensis to the emperor Hadrian in the year 129/130 CE.” Their analysis shows that the fragment of the inscription revealed by the IAA archaeologists is none other than the right half of a complete inscription, the other part of which was discovered nearby in the late nineteenth century and was published by the pre-eminent French archaeologist Charles Clermont-Ganneau. That stone is currently on display in the courtyard of Studium Biblicum Franciscanum Museum. Only a small number of ancient official Latin inscriptions have been discovered in archaeological excavations throughout the country and in Jerusalem in particular, and there is no doubt that this is one of the most important of them. The significance of the inscription stems from the fact that it specifically mentions the name and titles of Hadrian, as well as a clear date. The latter is a significant and tangible confirmation of the historical account regarding the presence of the Tenth Legion in Jerusalem during the period between the two revolts, and possibly even the location of the legion’s military camp in the city, and of one of the reasons for the outbreak of the Bar Kokhba revolt several years later and the establishment of ‘Aelia Capitolina’. Even after 2,000 years the inscription is in an impressive state of preservation. Once the excavation findings are published the inscription will be conserved and put on display for the public. The events of the Bar Kokhba revolt are ascribed to the reign of the emperor Hadrian. He is remembered in Jewish history for having issued dictates imposing the persecution and forced conversions of Jews, which the sources referred to as the ‘Hadrianic decrees’. The history of the Bar Kokhba revolt is known from, among other things, the works of the contemporary Roman historian Cassius Dio, who also mentions Hadrian’s visit to Jerusalem in the year 129/130 CE, within the framework of the emperor’s travels in the eastern empire. We know from ancient writers and the inscriptions on coins that the new city, which Hadrian established, was granted the status of ‘colonia’ (that is, a city whose citizens and gods are Roman) and its name was changed to Aelia Capitolina (COLONIA AELIA CAPITOLINA in Latin). That name incorporates within it the emperor’s name that is in the inscription, whose full name is Publius Aelius Hadrianus, and Rome’s main family of dieties. All of the information regarding the inscription will be presented in a conference open to the public on “Innovations in the Archaeology of Jerusalem and its Surroundings”, to be held this Thursday (23/10) on the Mount Scopus campus of the Hebrew University of Jerusalem.